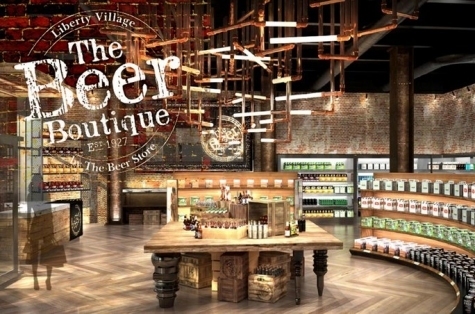 TORONTO, ON – The Beer Store, the Ontario beer retail chain jointly owned by brewers Molson Coors, Labatt/AB InBev, and Sleeman/Sapporo, has announced via Facebook a new retail concept called The Beer Boutique. In contrast to the vast majority of Beer Store locations in which customers have no direct access to product and order it at a counter similar to a fast food outlet, Beer Boutiques will be self-serve stores with a more open and inviting appearance, as shown by the concept illustration above. The first Beer Boutique is slated to open in Toronto’s Liberty Village neighbourhood this summer. Brands available beyond those offered by the three owners will be dependent on which breweries and import agencies request listings and pay the associated stocking fees. A design overhaul will not make a difference if The Beer Boutique continues to carry the worst brands available in Canada. The company needs to rethink the products that it carries before pointing a finger at retail appearance. People will continue to purchase beer regardless of the “look” of a store where they buy it. At the end of the day the only element of The Beer Store needing a makeover is the need for a variety of premium, craft brewed beers not made by their corporate conglomerate owners — only then will The Beer Store begin to win back part of their market which is quickly shifting its allegiance to the LCBO. agreed, the winooski beverage warehouse is one of the best beer stores on the east coast and looks terrible, inside and out! does not seem to impact their business to badly though as their beer selection keeps expanding. Why does this province continuously debate privatizing the LCBO while completely ignoring The Beer Store? At least the LCBO has some brands I actually want to drink. The Beer Store is not owned by the government. John Doe: Yes, which makes The Beer Store’s privileged position in the market less defensible. At least the Government of Ontario absorbs the LCBO’s profits. What the fail to realize is that it’s not the design of the store that’s the issue, I’ve been to mix and match beer stores where you can buy singles, even singles of good European beer in the InBev and Molson/Coors/SABMiller stable. I’ve talked to one of these and they said they don’t get into the beer store because it costs far too much to get into the stores. So I end up going to the liquor store for all my beer, and obviously I’m not alone because the beer store is feeling the pinch. What I would really like to see is more craft brews from other provinces, and the states, but nobody is offering that. I was disappointed to see the new, about to open beer boutique is owned by the folks at Molson/Labatt’s/Sleeman yadda yadda yadda. People who enjoy well crafted beer have known for years that the best beer invariably comes from the small craft brewers. The mass produced stuff from the big breweries is fine for the masses. However, if you like to savour your brew and have your taste buds challenged, then stick with the craft brewers. There’s something else sinister about this “Boutique”. As a TBS employee we’ve been told that eventually this design is to be put in place all over the province. But apparently they’re not interested in staffing it with existing TBS employees, but hiring an all new staff of part-time employees. Maybe even non-union. They certainly didn’t post any jobs in the stores, and yet we have a NOW listing and a job fair this Monday at the Delta Chelsea. I’ll see how this develops, but it doesn’t seem right to refuse work to the hundreds of part-time employees in their own stores that are constantly fighting with management for more hours. Especially after the last four years of integrating the LCBO deposit program into every store… creating a new chain that doesn’t deal with empties and hiring outside staff that will never know the joy of cigarette-filled Lakeport bottles. Lastly, if they really wanted to staff it with people that have a knowledge of beer to make a better experience for customers, it’ll be hard when they’re looking for employees that have no prior experience selling it.